The Congress high command is persuading Union Minister of Information and Broadcasting Ambika Soni to take over as the President of the PPCC. Anguished over the slow pace of procurement of paddy, hundreds of farmers descended on the roads, raised slogans against the state government and blocked the Moga-Barnala highway at Badhni Kalan here this morning. The Punjab government today said adequate compensation as per government's norms would be given to the farmers whose crops were damaged in yesterday’s rain and hailstorm. Congress MLA from Bholath Sukhpal Singh Khaira has supported Chief Minister Parkash Singh Badal’s demand for a higher minimum support Price (MSP) for the wheat crop. Chief Minister Parkash Singh Badal has requested Prime Minister Manmohan Singh to intervene personally at the highest level with the US administration to ensure that US President Barack Obama’s proposed visit to the Golden Temple is not aborted. The miseries of the rebel SAD MLA from Beas, Manjinder Singh Kang, deepened further when Harvinder Kaur, sister of alleged slain terrorist Nishan Singh Bhilowal, today approached the police with a complaint that the MLA had killed her brother. Kang, it is alleged, had claimed during a press conference in Chandigarh that he had killed Nishan Singh in 1992 for which he was honoured with Shaurya Chakra. Kang, who came in the support of sacked Finance Minister Manpreet Singh Badal, however, refuted the charges saying that he had not given any such statement. The police today exhumed the body of a woman, who was allegedly murdered by a granthi on October 21 in Panjaba village and buried on the gurdwara premises. The recruitment of dentists by the Punjab Health and Family Welfare Department has come under scanner with the Hoshiarpur branch of the Indian Dental Association (IDA) alleging discrepancies in the selection process. Coinciding with the withdrawal of Air India’s Amritsar-London-Toronto flight, Turkmenistan Airlines has introduced the Amritsar-Ashgabad-London flight twice a week and the Amritsar-Ashgabad-Birmingham and Amritsar-Ashgabad-Frankfurt, both once a week, from October 31. The Railways has decided to install Fog Safe, an electrical device, in 500 trains in the Northern India, so that accidents and other mishaps, which take place during the foggy season, could be avoided. The Khalsa Action Committee (KAC) and its constituent members today gave a call for A Punjab bandh on November 3 to protest against 1984 riots on their 26th anniversary. The kin of stranded 108 Punjabi youths today appealed the Centre to take up this matter with Libya to ensure their early release. The Greenpeace India and the Kheti Virasat Mission (KVM) yesterday sought direct subsidy to farmers in place of subsidy on chemical fertilisers to companies for promoting ecological farming and protecting soil from adverse effects of chemical fertilisers. Paddy growers blocked traffic at Pasian Kanchian from 12 noon to 2 pm here today, thereby hampering traffic on the Patiala-Samana and the Patiala-Sangrur roads. They were protesting against the alleged delay in lifting of their produce. Various government departments of the Punjab Government are not serious in implementing the provisions of the Right To Information Act (RTI) 2005. While various NGO’s were claiming this from past long time but now the government itself has acknowledged this harsh reality. Hundreds of farmers from six villages in Rajpura today raised slogans against the acquisition of 1,369 acres of land for setting up of an IT Park. The farmers from Aakri, Aakar, Sehra, Sehri, Pabra and Takhtumajra villages alleged that setting up of an IT Park in Rajpura was a gimmick to acquire their precious cultivable fertile land at a throwaway price for further selling to multinational companies. This is being done by people with vested interests who will earn crores after land dealings with those multinational companies, said Nardev Singh. With decreasing ground water level, potable water shortage is the biggest threat being faced by Punjab. Therefore, the Water Supply and Sanitation Department has taken up a task to provide clean drinking water to 3,161 villages throughout the state by 2012. The 50th annual conference of the National Academy of Medical Sciences (NAMS CON-2010) will be held at Government Medical College, Patiala, from October 29 to 31. Shiv Raj Patil, Punjab Governor, will be the chief guest during the opening ceremony of the conference. Keeping in view the need to apprise youngsters of Indian culture and traditions, a heritage walk was organised at Patiala today. Manjit Singh Narang, Commissioner, Municipal Corporation, flagged off the rally, which was organised by the Patiala division of the Indian National Trust of Art and Culture Heritage from Polo Ground in which 200 students from various schools took part. The rally began from Polo Ground and ended at Sheesh Mahal passing through Municipal Corporation office, the NIS and Mohindra College. Soni’s name has been included in the panel of three names shortlisted for selecting the President to head the PPCC. Sources said Usha Thakkar, who was made in charge to conduct the organisational elections in the state, had submitted a panel of two names, Capt Amarinder Singh and Jagmeet Singh Brar, to Sonia Gandhi, President of the AICC, in connection with the presidentship of the PPCC. However, sources said Sonia told Thakkar to include the name of Soni also in the panel. There are reports that Soni is reluctant to jump into the state politics. Though she belonged to Punjab, she has kept herself busy in the party national politics for the past several years and has held important positions in the organisation as well as in the government. Sources said the main reason for Soni’s reluctance was that the high command had not given her assurance that she would also be made Chief Minister in case the party won the next Assembly elections due to be held in about 14 months from now. The high command is keen to keep the field for the chief ministership open and not ready to make any commitment in this regard at this stage. For the past some days, Soni has consulted her close confidants in the party in the state, it is learnt. One of her supporters said Soni had vast experience to run the party and she could bring all warring factions of the Congress on one platform in the state. Sonia will announce the new President of the PPCC in a few days from now. Besides Capt Amarinder Singh and Brar, other leaders, who are trying hard to head the PPCC, include Partap Singh Bajwa. In case Soni refused, the tie will be among Capt Amarinder Singh, Brar and Bajwa. Tarlok Singh Himmatpura, district president of the kisan union who led the protest, alleged that officials of the procurement agencies were harassing farmers on the pretext of high humidity content in the grains. He said that humidity content was well within the permissible limit. They blocked the traffic for over two hours and the traffic was diverted through link roads by the local administration with the help of the police. The kisan leader further said the untimely rain in the past 48 hours in many parts of the state had also damaged paddy to some extent in many areas, besides increasing the humidity content. He warned that if the paddy was not lifted in time, the union would launch an agitation across the state. Bathinda: Protesting the alleged harassment to paddy growers, due to non-procurement of their crop for the past many days, farmers on the call of various farmer unions, including the BKU (Ugrahan), BKU (Dakonda), BKU (Krantikari) and BKU (Sidhupur), today blocked roads in different parts of the district. The farmers today blocked roads at Bhucho Khurd and Jethuke villages on the Bathinda-Barnala road, Bhai Bakhtaur village on the Bathinda-Mansa road, Ghuda village on the Bathinda-Badal road, Mandi Kalan village on the Rampura-Maur road, Bhai Rupa village on the Rampura-Salabatpura road and Maluka village on the Nathana-Bhagta road. District general secretary of the BKU (Sidhupur) Kaka Singh Kotra said the union had convened its meeting on October 25 at Patiala to chalk out further course of action. Mann said 17 farmer and labour organisations at a meeting held at Ludhiana today decided to block rail and road traffic in the state for 36 hours from October 29. Congress MLA from Bathinda Harminder Singh Jassi warned the Badal government that if its procurement agencies failed to procure the entire paddy till October 27, the Congress would stage dharnas at various places in the district. He gave this warning after taking a round of the local grain market to assess the procurement of paddy where a number of farmers complained to him that agencies were not procuring their paddy. 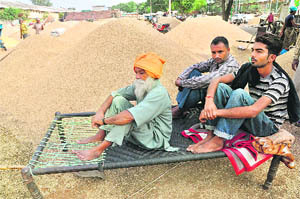 Pala Singh, an elderly from Multania village, said he had been spending days and nights here for the past one week as his crop was yet to be procured while another farmer Sukhdev Singh from Teona village said no official of any procurement agency had come to procure his paddy during past over seven days. The MLA was accompanied by a delegate of the PPCC K.K. 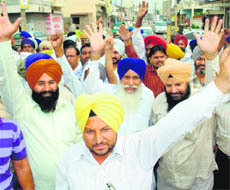 Aggarwal and district chief of the Congress (Urban) Ashok Kumar, Congress leaders Sukhdev Singh Chehal and Mohan Lal Jhumba. FARIDKOT: The procurement targets of Faridkot are likely to be upset as farmers of Bathinda, Moga and Muktsar districts have started heading towards grain markets here to dispose of their paddy produce. The procurement drive has remained smooth and immediate payment is being made for the procured grain. DC S Karuna Raju, who is supervising the procurement operations, said he had prepared a contingency plan to prevent the district’s paddy procurement getting derailed. The farmers coming from other districts were being welcomed and their produce was also being lifted. Gurpreet Singh, a farmer of Morh Mandi in Bathinda district, carried his paddy produce to the grain market at Jaito in Faridkot as he complained that it was not lifted by government agencies at his home place. Raju said against the procurement target of 6.60 lakh tonnes of paddy, about 4.47 lakh tonnes was purchased till this afternoon. The lifting was 94.5 per cent for which 100 per cent payment had been released to farmers. The FCI was supposed to lift 60,000 tonnes of paddy against which it had so far procured only 5,109 tonnes. The DC today shot a letter to Neel Kanth, Chandigarh-based senior regional manager of the FCI, to gear up the procurement drive. Patiala: Paddy growers blocked traffic at Pasian Kanchian from 12 noon to 2 pm here today, thereby hampering traffic on the Patiala-Samana and the Patiala-Sangrur roads. They were protesting against the alleged delay in lifting of their produce. Hundreds of farmers from nearby areas gathered at Kanchian and rued delay in lifting of paddy by government authorities on the pretext of high moisture content besides other factors. Punjab Chief Minister Parkash Singh Badal has ordered a special girdawari to assess the damage to the crop. Badal has directed the Financial Commissioner (Revenue) to issue detailed instructions to the DCs to immediately carry out girdawari on priority. Heavy rain lashed Patiala, Ludhiana, Jalandhar, Ropar, Hoshiarpur, Gurdaspur and Nawanshahar causing flattening of the standing crops and shattering of grain. Farmers in the region said the maximum damage had been caused to those who had grown basmati. Since basmati was sown late, it was harvested late. While 50 per cent of the non -basmati quality paddy had been harvested, most of the basmati crop was yet to be harvested. Meanwhile agency reports add that the minimum temperature dropped by a few notches in Punjab today a day after the region was lashed by heavy rain. “The agrarian economy of Punjab is in shambles with a debt of over Rs 35,000 crore on farmers. Only recently, a sample survey conducted by Punjab Agriculture University, Ludhiana, concluded that 2,890 farmers had committed suicides in two districts of Bathinda and Sangrur from 2000-2008,” he said. “The inputs involved in agriculture are becoming costlier by the day, be it diesel, pesticides, fertilizers, labour, etc whereas the prices for the crops of farmers are not remunerative,” he added. “If need be, you may please consider speaking to the President himself,” said Badal in his letter to the PM. President Obama is expected to visit India from November 7 to November 10 and a visit to the Golden Temple was on the itinerary. In a letter to the PM, Badal said there appeared to be some communication gap between Indian and US security agencies on the issue. “The US administration may be reminded that international dignitaries, including the Queen of England, Canadian Prime Minister Stephen Harper have paid obeisance at the Golden Temple without any security hassles,” said Badal, adding that Sikhs across the world would be disappointed if President Obama did not visit the Golden Temple. On the issue of observance of religious decorum (maryada), Badal said the US President would be well-aware of sensitivities involved. “Across the world, when dignitaries visit religious shrines, they are always briefed about the observance of the maryada of the religion concerned and they always respect the sentiments of the followers of that religion. But if there is any misunderstanding on this issue, it can be resolved at the diplomatic level,” the CM added. Harvinder in her complaint to the police stated that in 1992 Nishan had gone for some domestic work, but never returned. “Later, we came to know that Nishan was killed in an encounter and we could not know what exactly happened to him,” said Harvinder during a press conference here. The woman, Avinash Rani, had gone missing since Thursday morning when granthi Gulab Singh allegedly strangled her and later buried the body in a corner of the gurdwara. Avinash Rani was the wife of the priest of a nearby temple and had a tiff with the granthi of the newly built gurdwara, who took objection to the religious discourses being played on the loudspeaker of the temple. The priest and the granthi had wordy duels on the issue. However, the report about the killing of the woman leaked when the granthi tried to hire a mason to bury her body and rebuild the floor, said the police. The police swung into action and, in the presence of a magistrate today, exhumed the body and sent the corpse for a post-mortem examination. Banta Singh, Sub-Inspector, who is investigating the case, said Gulab Singh had been arrested under Sections 302 and 201, IPC. He said the investigations so far had revealed that the granthi strangled the woman in the morning when she was going to the field and then hit on her head with an iron rod. Thereafter, he dumped the body in the gurdwara and later buried it there. In the meantime, the police questioned several persons when her husband filed a missing report and got suspicious about the granthi. He was interrogated when the report of his efforts to hire a mason to dispose of the body leaked in the area. The government had launched a drive to recruit 34 dentists after 15 years. Members of this branch alleged that the department had ignored the eligibility criteria while calling candidates for interview. Moreover, it issued a corrigendum for providing backdoor entry to some candidates, they alleged. Talking to TNS, Dr Amarjit Singh, an executive member of the Hoshiarpur branch of the IDA, said the department had conducted a test for the recruitment of dentists at Panjab University, Chandigarh, in August. Against the 34 posts, 2,694 candidates had appeared. But the department did not display the list of qualified candidates along with the marks obtained by them, he added. Dr Amarjit Singh further alleged that certain candidates, whose application forms were incomplete, were even allowed to appear in the written examination, adding that the authorities even called those candidates for the interview who had not submitted the required certificates. Refuting the allegations, Director, Health and Family Welfare, Dr JP said they had issued a corrigendum asking the qualified candidates to produce their documents to prove their eligibility on or before the interview date. “The list the qualified candidates will be displayed on the website only after the final results were out,” he said. Meanwhile, members of the branch demanded that the Punjab Government should increase the posts of dentist from 34 to 800 and post them in rural and urban areas on the same pattern as MBBS doctors were being appointed. Apparently, Turkmenistan Airlines intends to cash in on a sizable number of passengers, who prefer to travel from Amritsar to London and Toronto. This will take the total number of flights of Turkmenistan Airline to 10 flights a week, as it is already operating the Amritsar-Ashgabad flight six days a week. Turkmenistan Airline will also operate 737800 aircraft with the seating capacity of 160 and 2.5 tonnes of baggage and cargo capacity on new routes. Station Manager (Turkmenistan Airlines) Dinesh Kurl has also confirmed the introduction of new airbus and enhancement in flights. Sources in the aviation sector said Turkmenistan Airlines would have advantage of reaching London about one-and-a-half hours before Air India’s Amritsar-Delhi and connecting flight to London from Delhi. Besides, the overseas airlines charged nearly Rs 2,000 less than the national carrier. S. K. Budhlakoti, general manager, Northern Railway, while disclosing this here yesterday, said the device, which worked on GPS technology, would be installed on an experimental basis for the first time and that too in those pockets which were dotted with automatic signal systems, so that accidents could be avoided. Budhlakoti said the Ludhiana-Chandigarh rail link would be completed by December 2011, Taran Taran-Goindwal Sahib rail link by March 2011 and Abohar-Fazilka rail link by December 2010. 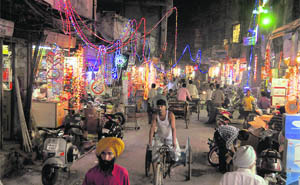 Apart from it, the proposal to set up Ferozepur-Amritsar rail link had been sent to the Railway board after second survey, in connection with its feasibility, revealed that it would be positive venture. He said as there was a number of problems in connection with Jammu-Katra rail link so he was of the view that it would be completed by the end of 2013 as a number of other agencies were also involved into its execution. A proposal to introduce a train between Ferozepur-Hardwar was also under consideration. Besides, Jalandhar-Jammu rail line was being doubled. The work of doubling of track on the Ferozepur-Delhi rail section with its electrification would be started in due course of time. The speed of about five trains running on different sections had been increased. A dormitory of 20 beds would be added into local divisional hospital. To a question connected with transfer of 72 acres of land belonging to the Railways, located in the Makhu area, to some persons by the Punjab revenue authorities, he said as he had come to know about this thing for the first time, he would get it inquired. Addressing the media here, KAC convener Mohkam Singh said they would appeal to all business establishments and educational institutions to remain shut on November 3 as a mark of tribute to the innocent people killed 26 years back. “The bandh will be complete and we will seek the cooperation of the SGPC, DSGMC, Damdami Taksal and the Sant Samaj in making it successful,” he added. Talking to TNS here today, the kin of the stranded youths said they would soon meet Union Minister of State for External Affairs Preneet Kaur and state Deputy CM Sukhbir Badal to pursue their cause. Paramjit Singh (30) of Kapurthala is among the 108 youths, who has been stranded in Libya as their passports had reportedly been retained by the immigration office of that country. His maternal uncle Ikhwinder of Jalandhar said he along with several other youths had gone to Libya in April 2008 through a travel agent of Jalandhar, who had assured them that they would get work in an English company for two years. A total of 700 youths had gone to Libya through different travel agents with the same assurance of two years’ work, free stay and medical facilities, he added. However, they were provided work in a company owned by a Pakistani, he said, adding that they had not been given salaries since January 2009. He further said they had been sent to Libya with a three-month entry visa. After three months, the Pakistani company got their one-year work permit visa, but after that the company failed to extend their visa, he added. Ikhwinder said his nephew informed him over the phone that they had also contacted the Indian Embassy in Libya for help but did not get any positive response. Executive director of the KVM Umendra Dutt and sustainable agriculture campaigner of the Greenpeace India Sunil Prabhakar said here today that the Centre should grant subsidy for organic fertiliser practices, as it would help in improving soil health. Dutt also sought 50 per cent share of the total subsidy, about Rs 50,000 crore per annum being spent on chemical fertilisers, for ecological agriculture practices so that more and more farmers got themselves involved in natural farming to protect soil from further degradation. He said farmers, who were improving carbon contents in soil by plowing paddy straw in fields, were getting nothing from the government. Prabhakar flayed the Centre’s nutrient-based subsidy system on chemical fertilisers, which was introduced on April 1 last. He said this system had been promoting chemical fertilisers in place of organic fertilisers. He said the Greenpeace India was visiting farmers of Assam, Orissa, Madhya Pradesh, Karnataka and Punjab to know about soil’s degradation in the past five years. “In fact, farmers have started selling their produce at lower rates to avoid further delay. They have been waiting for their produce to be lifted for almost 10 to 15 days now, but to no avail. Farmers residing near the Haryana border have started shifting their paddy to mandis of Haryana so that they won’t have to wait for too long,” added general secretary Satwant Singh. President of the Jamhiri Kisan Sabha Harbhajan Singh Butter said the government had been making promises time and again, but was not taking any substantial steps in that direction. “Moreover, the equipment being used to measure moisture content showed different readings for the same produce at different times. There is a problem in their machinery and they are using it to their convenience. If this continues, the farmers will suffer heavy losses,” he added. In order to take corrective measures, senior functionaries of the Department of Information Technology (Administrative Reforms), the Punjab Government has now shot off letters to all Financial Commissioners, Principal Secretaries and Administrative Secretaries to the Government of Punjab, directing them effective implementation of the RTI Act and some specific guidelines have been asked to follow. With a view to make the effective implementations of the provisions of the RTI Act, the guidelines, which have been issued recently includes that only the official with sufficient seniority may be appointed as the PIO and adequate supporting staff with required equipment (computers, photocopiers etc) be provided to them. “Responsibility of the non-compliance/violations of the RTI Act should be fixed. Digitisation of data should be taken up on priority as a part of the government reforms process,” reads the letter. The Department of Information Technology (Administrative Reforms), the Punjab authorities have also stated that role of the first appellate authority was virtually negligible in the government departments. “They hardly hear the first appeal preferred to them and as result 90 per cent of the cases comes to the Punjab State Information Commission as complaints and not as second appeals”, they added. Another important point mentioned in the letter is that Director General, Mahatma Gandhi State Institute of Public Administration, Chandigarh may be consulted along with the list of the PIO’s and Appellate Authority so that they could be able to impart training to these officers. Hundreds of farmers from six villages in Rajpura today raised slogans against the acquisition of 1,369 acres of land for setting up of an IT Park. The farmers from Aakri, Aakar, Sehra, Sehri, Pabra and Takhtumajra villages alleged that setting up of an IT Park in Rajpura was a gimmick to acquire their precious cultivable fertile land at a throwaway price for further selling to multinational companies. This is being done by people with vested interests who will earn crores after land dealings with those multinational companies, said Nardev Singh. Bhag Singh of Akri village, Pal Singh of Akar, Surinder Singh and Garib Singh of Sehri village, Karnail Singh and Harkirat Singh of Sehra village and Maan Singh of Tahktumajra village said villagers were against setting up of the IT Park on their agricultural land. We are ready to shed our blood to save the fertile land and will fight till death to oppose forceful acquisition, said Nardev Singh. A villager said the government was trying to acquire land of poor farmers with marginal landholdings from two to three acres only. Farmers from Akri village will loose maximum land, 185 acres, they said. Most of the residents in these villages have already lost their land and homes during the time of partition in Pakistan now they are again terrified of dislocation. 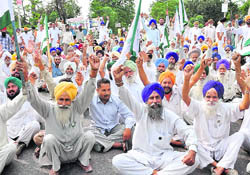 The agitating farmers raised slogans against setting up of the IT Park and gathered outside the residence of Raj Khurana, chief parliamentary secretary and Rajpura MLA. Khurana pacified the farmers by saying that a meeting will soon be fixed with Chief Minister Parkash Singh Badal to find solution of their problem. Meanwhile, chairman of the Punjab Industrial and Communication Technology Corporation Limited Harjeet Singh Grewal claimed that the entire land was a shaamlat (common land), which belongs to the panchayats of respective villages. Moreover, the entire area will get a new look after setting up of the IT Park, as multinational companies will be accommodated here to generate revenue. Land prices are bound to increase from mere Rs 20 lakh to one crore or more after setting up of the IT Park, said the chairman. Grewal also claimed that 1.5 lakh professionals would get jobs in the IT Park and Rs 80,000 crore yearly business was estimated in the park. Education city, a five star hotel, widening of roads and lot more will be done here in coming years or so, he said. In Patiala, the department has come up with a Rs 45-crore project, in which Rs 12-28 lakh would be spent on each village for the implementation of the scheme, depending on the need of each village. Not only this, the department will put up new tubewells in villages that are short of it. The department has decided to complete the project by March 31, 2011 and officials of the department have already started surveying villages in the regard. According to Dr DS Bhullar, the press and publicity committee’s member, the conference will be a scientific feast, including talks by experts of international repute followed by open discussions, especially modern multi-disciplinary care for breast cancer, implant-infections, and changing trends in medical education. Addressing the gathering, he said it was our responsibility to preserve our culture for our future generations. He said the youth was falling prey to various social evils, which could prove deadly in future. He added, “Earlier our elders had very respectable place in the society and they played an important role in transferring culture but with the passage of time, we are ignoring their importance. People are preferring nuclear families where no one has time for each other and there is no interaction.” He asked youth to respect their elders and give them their due share in life. Advocate Sarabjit Singh Virk, convener of the rally, while addressing the gathering said, “Patiala has rich culture and we all must make efforts to transfer this information and cultural values to our future generations.” A large number of elders and dignitaries, including president of the District Bar Association Jitender Singh Grewal, Dr Harbhajan Singh, Dr GS Bajwa, Dr Davinder Singh, DSP Vigilance Paramjit Singh were also present.